The president approves the military trial law. I believe that taking the army out of politics, removing two judiciary systems, making the army obey the authority of civilians are part of democratization for Turkey which seem unstoppable right now. The strange thing is the behavior of CHP. I mentioned several times about how how this party which was established by Ataturk, works . CHP is planning to take the matter to the constitutional court..Basically they are against the idea of "the army personnel being tried by the civil court"!! This law is one the most important laws of Turkey´s recent history. the army judiciary is the result of past army regimes and it is against the very basic principles of the democracy. Turkey is a candidate country for EU. She has to lift the democratic standards higher than what we have there.. Anyway, we will all see how it will end.. 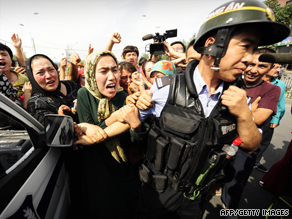 The other hot topic was Uighur Turks in west China.. The interesting thing I noticed this time on the net was some Turks making comparison between the "Kurds in Turkey" and "Turks in China" this time. Though there are still some Turks who would say something like ´we have done nothing to Kurds but look at China how they are treating our blood brothers´, but I can see that at least there are a few voices reminding that we have not been that ´innocent´at all about our Kurds.. But of course the entire incident in China is not a pleasant incident and everyboody should protest it. At least, we have to try to understand their suffering..
No people should suffer because of their ethnicity, beacuse of their religion or because of their ideas.. Although many accused the PM of not being active enough on the topic, he used the words ´nearly genocide´ to describe the events..
Our "one minute" PM who acted like a hawk in Davos against Israel was quiter and we did not see thousands of people protesting on the streets of Turkey..
Kurds wants to join Turkey? The other interesting topic was about Iraqi Kurds..
Well of course it was not entirely true but there is a growing friendship between Turks and Kurds of northern Iraq. Our president lately called them ´Kurdistan´ (instead of Northern Iraq) which was a taboo breaking act itself. This news reminded us our late president Turgut Ozal and his ideas about the region..
And he was trying to convince the Kurds in northern Iraq so that "Turkey and Kurds in northern Iraq would form a confederation"!!! If it did happen, it could have been definitely a whole new ball game in the region..
Tamerlane and hodja go to a hamam (Turkish bath). -If i was a slave, how much would you pay for me? -I am not an expert but I think you will be worth 15 golds. -Hodja, he says. do your ears hear what you say? Only this peshtemal (a special towel you wear in hamams) is worth 15 golds. -I, in fact, gave that figure for the peshtemal.. I just saw that some people are "still" complaining about my writings here.. I don´t think any Turks will challenge the correctness of the news here. They are the news from Turkey..
No accusations or no wrong translations I am afraid.. If you disagree, post it in the forum and tell us what was wrong!!.. "meyve veren agaç taslanir" which can be translated as "The tree that gives fruit, gets stoned"
I think the English version might be "the nail that sticks up gets hammered down"